Premieres Wednesday, April 3 at 10 p.m.
• Egyptian pharaoh Pepi II came into power around 4,300 years ago at the age of just 6 years old – about 300 years after the Great Pyramids and the Sphinx were built. The pharaoh ruled for at least 60 years – some even say 90 years – marking the longest reign in all of Egyptian history. • At the start of his reign, Pepi II was very much in control of the country, but, after studying the grander tombs of local governors from the latter part of Pepi II’s reign, archaeologists now know that he was gradually relinquishing control to them. • Pepi II died at the age of 94, and there are hardly any traces of his immediate successors. None of his brothers or five sons reigned for very long. 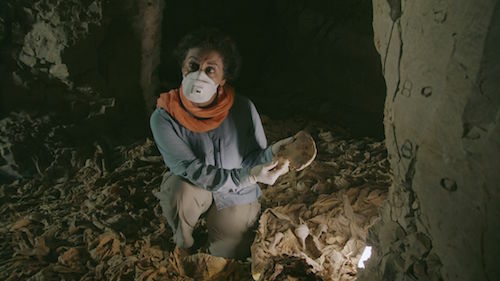 • Pepi II’s tomb was looted, his sarcophagus had been opened and everything inside was removed, including his mummy which has never been found. There is also evidence that the temple of his father, Pepi I, was intentionally set on fire. • Inscriptions in the tomb of governor Ankhtifi, who governed in the years between Pepi II’s death and the creation of the mass grave, state the Southern part of country was dying of hunger and that the whole country became like “starving locusts,” suggesting that Egyptians were suffering from a mass famine around the time of his death. • After Pepi II’s death, the level of the Nile dropped so significantly that the islands of eastern and western Elephantine merged into one, and the city expanded into what had previously been the marshes in between, suggesting that Egypt’s climate was gradually changing and becoming dryer during the Old Kingdom. • The terrible climate crisis, combined with the underlying political problems, led to war for 130 years. The soldiers in the mass grave most likely died at the end of the protracted civil war that followed the chaos caused by famine. • In the desert near Luxor, in southern Egypt, archaeologists open an exceptional tomb dating back more than 4,000 years ago. 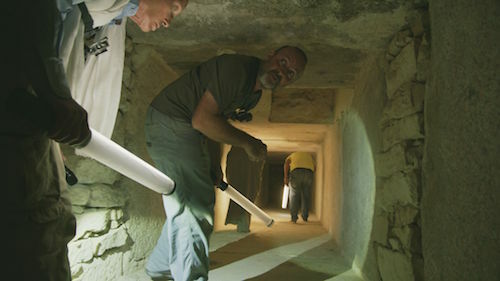 Inside, they find the mummified remains of at least 60 people, all of which appear to be male. A mass grave of this manner is extremely unusual for ancient Egyptians, as they were traditionally buried alone or with close family. • Further examination of the bodies found in the mass grave reveals the men died of horrible trauma. Photos of the remains reveal holes that were most likely caused by rocks from a slingshot, being struck by a mace, and arrows going through their bodies, indicating the men died in battle. • An examination of ice cores collected from Mt. Kilimanjaro, with 33 meters dating back as far as 11,700 years, reveals a dark layer of dust, recorded about 4,000 years ago. The layer points to evidence of a dramatic climate change around the same time the Old Kingdom collapsed. • An examination of mud cores in Egypt’s Lake Qarran reveals that during the Old Kingdom, the lake was much larger and deeper than it is today, with a depth fluctuating around 200 feet. Layers of gypsum and iron ore found in the cores show that the freshwater lake dried up, leaving behind just a few ephemeral pools of water. This study confirms that the global drought seen in the ice cores also hit Egypt at the time of the Old Kingdom’s collapse.